The advent of children’s museums is an effort to provide alternative spaces where learning can be an active game of engagement. Exhibits built for children’s museums emphasize learning through play and social interaction of the visitors with the exhibit and with each other. Comments, discussion and questions explore the possible results, helping develop reasoning skills during the interaction. An exhibit can teach through many different ways of presenting content. For instance subject matter can be presented through text, visuals, sound, and interactive machinery of gears and levers manipulated by the child. A good children’s exhibit also presents it’s content with attention to the narration, or story telling progression. The EYE EXHIBIT was designed to teach children about the physiology of the human eye. Conceived as a small room that in the front duplicated the inside musculature of the eyeball, it was also composed of fun, attractive interactive stations that visually and tactically invited the visitor to play. A round window installed in the front of the small room simulated a giant eyeball — cornea, pupil, iris and lens with operable parts. The operable parts opened and closed (dilated and contracted) through a system of cords and pulleys allowing the young viewer to manipulate the different parts, while learning how the eye worked. Other learning stations were placed in different areas of the eye room. Children could touch the rods and cones, parts of the eye that help us see color. On one wall the young visitor was invited to play the game, “Do EYE Know U?” consisting of matching hidden animals pictures to eyes that were drawn on an adjoining panel. Animals to whom the eyes belonged were an owl, a frog, an alligator, or a cat. The walls of the room were also covered with veins and arteries in relief that could actually be physically traced by the child. The roof of the room was transparent. On the dome were painted graphics of ancient Egyptian, Chinese, and Syrian glyphs of eyes along with other pictures of eyes from different cultures around the world in an exhibit titled, “Eyes In The Sky”. 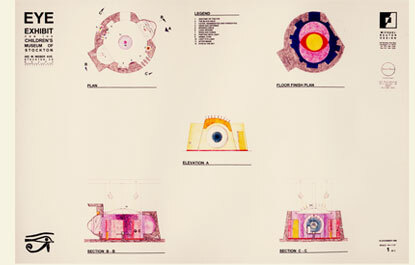 Design drawings of the EYE EXHIBIT for the Children’s Museum of Stockton by architect Michael Reuter.